Phil Bitzel with a nice Jack. While the offshore scene has been running hot the local waterways have also been producing some quality fish especially on the lead up to the new moon. 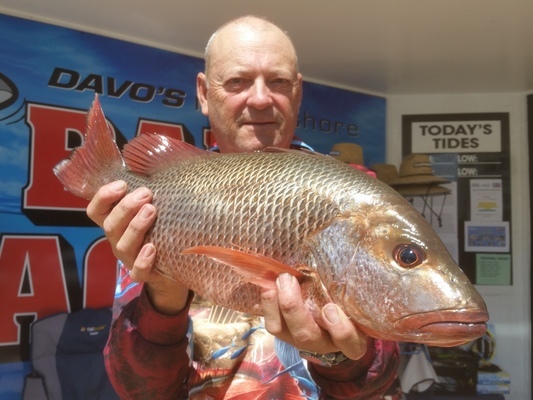 With the bigger tides and no rain the Jacks have been in the upper reaches of the Noosa and Maroochy rivers. The most popular ways to target these fish has been on surface poppers and stickbaits as well as weedless rigged soft plastics cast deep into heavy cover and worked out into deeper waters. When fishing the sunken structure you are best to fish with a minimum of 20lb leader to get the bite but be prepared to get bricked and busted off. Elsewhere around the Noosa river mouth whiting, flathead, bream and the occasional tailor have shown up. These fish all taking a wide range of soft plastics as large as 4 inches to surface lures in the 80mm range as well as metal slices in the 15 gram size range. If bigger flathead are your target then try and find the sand flats with outlines of the bigger female fish at low tide as this can really help. The bridges of Donella and Weyba have been producing quality fish including various species of trevally and the odd jack deep in the cover of the pylons. Live baits at night are one of the best ways to target bigger fish, just be sure to have the correct gear to stop them. Offshore the cobia, Spanish mackerel, spotty mackerel and tuna have been running thick all along the inshore reefs from Halls Reef to Old Woman Island. The best ways to target these fish have been with pilchard floaters on 4/0 gang hooks, Live baits on stinger rigs, metal lures cast directly into bait balls and trolling big dead baits on chin weighted gang hooks. Using a small length of wire is helping to prevent gear loss to sharp teeth so be sure to use some. The sharks are very thick at the moment so once you hook a fish tighten down that drag knob and hold on! From the surf we have seen a mixed bag of smaller dart, bream, whiting, flathead and the odd tailor. These fish do not require a heavy surf rod so break out your estuary gear and have a flick with a beach worm and running sinker rig. With the lead up to the new moon many anglers are after jew fish. These require a stealthy approach at night time with only the best baits. Be sure to use some bait wrap to keep baits in place for longer and those anglers who own a baitrunner style reel should be using these with live baits. Freshwater has been quieter this week with the surface bite slowing down. We have seen a bit of rain on the local lakes and dams which has cooled things a little. Be sure to target the shady areas once the sun has risen and throw a mix of hardbodies, blades, soft vibes and spinnerbaits and work each snag thoroughly to extract the big fish lying in wait.